It is not my habit to speculate, although I have privately for some time, that the Rolling Mill Hill project is going to enter receivership, but I have it on good accord that this will come to pass. Should this project enter receivership, it will be the third condo development in Middle Tennessee to do so since February 5, 2009. The previous two projects were the 5th and Main building in East Nashville and The Braxton project in Ashland City, 25 miles from downtown.People close to the Rolling Mill Hill project are not willing to comment at this time, but their silence is an indication of the severity of the situation in this writer’s humble opinion. 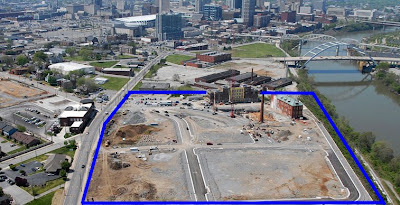 The 34 acre Rolling Mill Hill project is located in Nashville’s Sobro district and is situated directly on the banks of the Cumberland River giving it incredible views of the city and nature. From the beginning, it was an ambitious mixed-use development that strived to balance urban redevelopment with modern architecture and a dash of green engineering. The entire project was ultimately mastered planned in two phases, each to include several structures of varying priced condos, townhomes and commercial space. Currently, there are less than 70 completed condos. Again, it is NOT confirmed that Rolling Mill Hill is entering receivership, I simply have it on good accord that this will happen in the coming weeks. This would be Village Real Estate’s second major project in 4 months to suffer the same fate, 5th and Main being the first (of course, Village does represent most of the downtown developers). What does this mean for downtown Nashville’s future? It is certainly not a positive sign, but it’s also not a horrific sign either. It would have be one thing if the entire 34 acre project was nearly complete, but this project was in its infancy and at its most vulnerable with loads of money sunk into development costs, but no finished product to sell or lease. Quite literally, it was caught in the perfect storm of timing, economy and circumstance. That being said, I do expect the negative press to further dampen downtown condo sales and prices. Look for this malaise to continue until such time as the new Music City Center convention center or Medical Trade Center projects are given the final green light to break ground. Of course, there are no guarantees there either. It appears that it may continue to be a tough time for downtown developers. On the bright side, these type of occurences always create opportunity for investment. Someone smarter than I is going to step in and make a literal fortune on these projects over the next decade. The Tennessean today has reported that Bank of America has filed a lawsuit just this week in Davidson County Chancery Court to begin the process of taking this project back from its failed developers Direct Development and RMH development. It has also been reported that John Cheatle will become the court’s appointed receiver for the project. This is by no means the end of the road for Rolling Mill Hill. In fact, it will probably be seen as a necessary rebirth that will ultimately be the best for future condo owners. I expect the development to emerge from receivership in 3-4 months with a healthier developer attached to the project.